If you decide to go with Philips Hue smart lights, you can easily spend hundreds of dollars on each room as you upgrade your old “dumb” lights to smart LED bulbs. After all, standard A19 color bulbs from Philips Hue are a whopping $50 each. 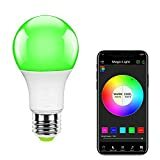 Here’s another option: check out MagicLight WiFi Smart Light Bulbs, which offer very similar features for just $16 a bulb or under $15 if you buy a 2-pack. In other words, you can buy three of these bulbs for every one comparable bulb from Philips Hue!